In this post, we’ll share some of the insights from this presentation. We’ll discuss how to make more data-based decisions, the value of a micro-target marketing strategy, and some key takeaways from Tanner Health System’s marketing experience. Choose the right data. It can be overwhelming to understand how the various available datasets differ, why they differ, and which is the right dataset for your planning and marketing needs. Weeding through the options and determining the right data source is a critical first step. Without a doubt, when armed with insights from the right data, planners and liaisons can gain a more complete picture of the opportunities within their market. Read more here about two of the main datasets—state and all-payer claims data. Ensure you have a reliable data process. "Data processing" refers to the collection, aggregation, cleaning, and updating of data so you can use it to make informed strategic decisions. Once you have clean, organized data, you can more effectively use that data to analyze and extract helpful insights. Not sure how strong your data process is? Take this quiz to find out. Inform your plans with micro-target marketing. Mass marketing, shotgun marketing, spray and pray marketing—call it what you like, but if your marketing strategy can be described in any of these ways, you’re likely wasting valuable money, creating marketing programs with no trackable ROI, alienating large patient groups, and missing opportunities to connect with your preferred population. Micro-target marketing will allow you to start creating promotional campaigns that produce trackable, positive results. 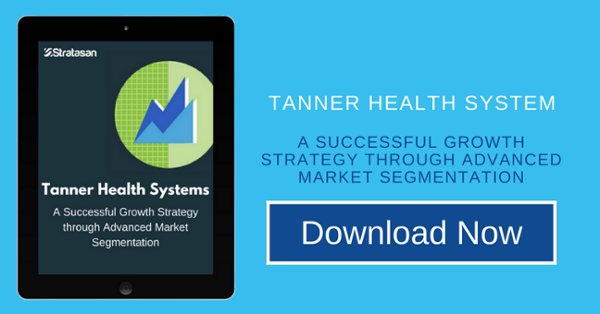 Read more about Tanner Health System’s micro-target marketing experience below. Strategists at Tanner Health System want to know: what opportunities exist in our market to increase volume? As opportunities are identified, Tanner will launch their 11-step strategic planning process to address growth potential. Through block group and census tract analysis the team identifies the demographics, healthcare utilization, buying habits, lifestyle choices, and out-migration trends of the target audience as well as main competitors. They deploy marketing tactics with marketing campaigns based upon demographics and psychographics of their target populations. They track the effectiveness of marketing endeavors by comparing current to past performance, tracking overall volume, payer mix, and financials. Finally, they compare performance of their overall market (service area) as well as the targets to show results of their targeted marketing campaign. By deploying data-based marketing tactics, tailoring marketing campaigns to better connect with specific demographics and psychographics of their target populations, and pivoting strategies as needed in real-time, Tanner Health System has been able to expand their business through thoughtful, trackable, and informed intelligence. For more information on how you can uncover and address opportunities, identify when strategies need attention, and create action plans that produce measurable results contact Sean Conway and schedule a discovery call today.